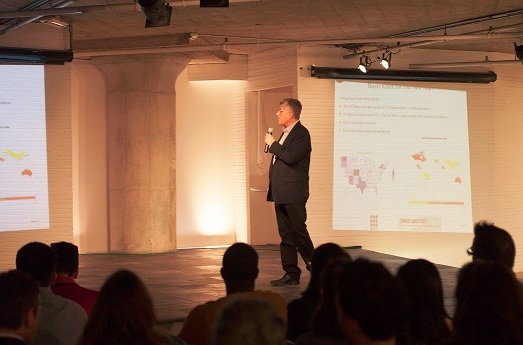 I was pleased to present last evening at the Grid110 Demo Day hosted by The New Mart, LA’s premiere fashion mart in DTLA. Grid110 is a new start-up business accelerator in partnership with the Office of the Los Angeles Mayor. My topic was putting a new face on the LA apparel industry using data science methodologies. My analysis used data sets from the Los Angeles Open Data repository. I’m a big proponent of government open data resources with the goal of improving the lives of citizens in ever more data-driven cities. My presentation is provide below. Check out the data visualizations especially the geospatial data analysis clusters showing business starts for the past 10 years across the various industry codes that constitute the LA apparel industry. Moving forward, I will be collaborating with Grid110 in 2016 to publish a new Fashion Tech industry report, develop a new Shiny app, and collect data points for a new Fashion Tech sector database. Exciting stuff! My new 100% online course is starting on Jan 13 – Introduction to Data Science. The course is hosted by UC Davis Extension and is intended as a launching point for those wishing to transition into the field in order to find employment opportunities. Students will gain the skills that are transforming entire industries from healthcare to internet marketing and beyond. In this course, students will gain a hands-on introduction to using the R programming language for data analysis. In addition the course will define the data science process, including data acquisition, data munging, exploratory data analysis, visualization and algorithm usage.